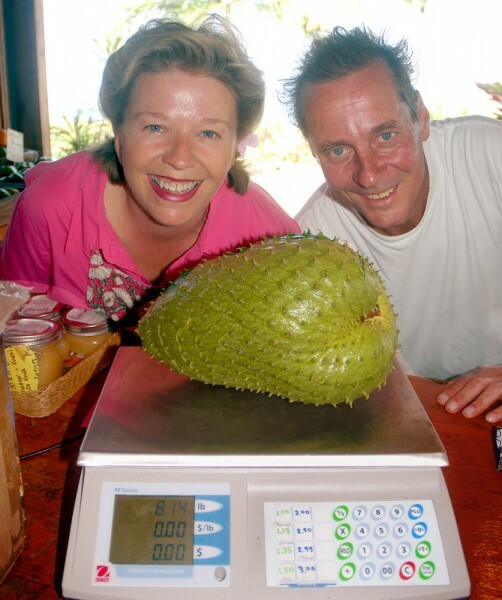 Beth Smith and Ken Verosko, owners of the South Kona Fruit Stand and Farm with their Guinness Award-winning 8.14 pound Soursop fruit. Also called Guanabana, the fruit measured 24 inches around and 11.5 inches long. This gigantic fruit was recognized by Guinness as the world’s heaviest soursop. 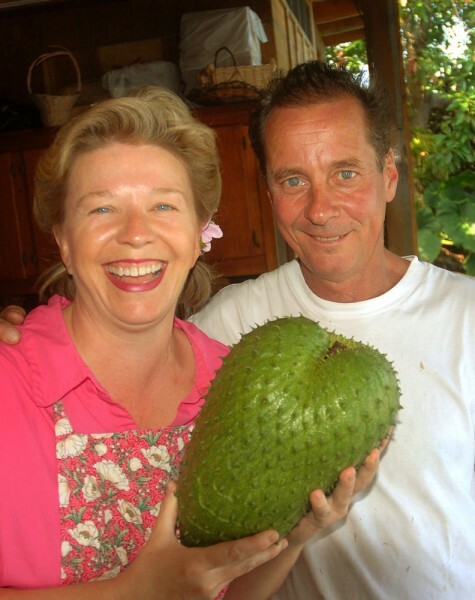 The taste of soursop is like “a pina colada without the rum” — a combination of pineapple, banana, lime and coconut. A soursop is ripe when a yellowish-green and soft to the touch. To eat it fresh, you cut it in half and spoon out the fruit – don’t eat the speeds; spit them out, like eating a watermelon. The exotic fruit can be used to make a delicious juice, preserves or jelly. In Malaysia, its delicate flavor enhances ice cream and puddings while in the Philippines, a young fruit is cooked as a vegetable with coconut milk. Medicinally, the soursop has multiple uses. Young shoots and leaves are a remedy for coughs and indigestion. Leaves are mashed to alleviate eczema and rheumatism. The unripe fruit has astringent properties. The huge soursop was grown right here on our six-acre farm, grown alongside 700 fruit trees, including mango, avocado, citrus, pomegranate and dragonfruit. The season it’s ripe varies, but you can often find it for sale here at the South Kona Fruit Stand — just not usually quite so big!